Dr M. Lalitha and M. Nandini have been widely acclaimed as outstanding South Indian classical violinists of the present generation. Lalitha and Nandini have enthralled the audiences with their spell binding music Dr. M. Lalitha and M. Nandini hail from the Sishya Parampara or the direct lineage of Sri. Baluswamy Diksitar, brother of one of the musical trinity Sri Muthuswamy Dikisitar who was responsible for bringing the violin into the firmament of South Indian classical music and also belong to the Sishya Parampara or the direct lineage of the Trinity - Saint Tyagaraja, Sri Muthuswamy Diksitar and Syama Sastri and Harikesanallur Muthiya Bhagavathar. They also learnt from their mother Smt. Subhalakshmi Muthuswamy. Lalitha and Nandini are regarded as highly imaginative virtuoso violinists. They have been applauded by both connoisseurs and laymen alike for their original and unique style of violin playing. Their violin playing is known to be replete with ragabhava. They have specialized in playing varnam-s in 5 grades of tempo and in playing Kalpana Svara-s in 3 grades of speed, which is a prominent and unique feature of their style of Violin playing. They enrapture their audience with imaginative improvisations and intricate rhythmic patterns fused with melodic sweetness. 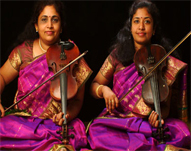 • LALITHA and NANDINI have been awarded several prizes, awards and titles by various organizations in recognition of their talent and dedication in the field of South Indian Classical Music. • 'GOLD MEDAL' awarded by His Holiness Shri Shankaracharya Swamigal of KANCHI KAMAKOTI PEETAM for securing the First place in the State Violin competition. • Title of `SAI GANA MANI’ awarded by Sai Spiritual Centre, Chennai. • Title of `YUVA KALA BHARATI’ awarded by Bharat Kalachar, Chennai. • Title of `INNISAI JNANA KALA MANIGAL’ awarded by Sri Kalikambal Kamadeswarar Devasthanam, Chennai. • Honoured by the organization MOHANAM as `THE MOST TALENTED ARTISTES’ of 1991, Chennai. •`TAMBURA PRIZE’ for the `BEST CONCERT’ of the Music Season, awarded by The Indian Fine Arts Society, Chennai. • Title of `NADA VINODINI’ awarded by Sri Ranjani Trust, Chennai. • RAJAMANIKAM PILLAI CENTENARY AWARD for `Excellence in Violin Playing’ by the Sri Ragam Fine Arts, Chennai. • Awarded the prestigious title of `KALAIMAMANI’ which is the Highest Honour in Music and Performing Arts conferred by the State Government of Tamil Nadu. • Dr. M. Lalitha and M. Nandini were recently conferred with the title of `BHARATHA VIOLIN VADHYA THILAKANGAL’ by His Holiness Sadguru Srimath Santhananda Swamigal in Chennai. • Maduram Narayanan Memorial Award for the BEST SENIOR VIOLINIST from the Madras Music Academy, 2004-2005. • BEST SENIOR VIOLINIST AWARD from the Indian Fine Arts Society Chennai, 2004-2005. • Lalitha and Nandini were awarded the title of `Asthana Vidwan’ of the Sri Bhuvaneswari Peetam and Sri Sri Judge Swamigal Adistanam, Pudukottai. • Lalitha and Nandini were awarded the title of `BHUVANA SANGEETHA PRAVAHINI’ by the Chennai Om Sri Skandasramam trust for their services and contribution in the field of music. • INTERNATIONAL FELLOWSHIPS AWARDED Dr. M. Lalitha and M. Nandini have been awarded with the US and UK Governments highest award. Dr. M. Lalitha has been awarded the `FULBRIGHT FELLOWSHIP IN PERFORMING ARTS’ while M. Nandini has been awarded with the `CHARLES WALLACE TRUST FELLOWSHIP IN PERFORMING ARTS’ which are highly competitive and prestigious awards. • Both the sisters collaborated and worked on World music, ethnomusicology and fusion. They have been selected as CULTURAL AMBASSADORS and dignitaries to the US and UK respectively. • Honoured as `ISAI PUYALGAL' in the Murugan Temple, London. • Honoured as `GANA VARSHINI' in the Mahalakshmi Temple, UK. • Honoured with `Gold Chains' in the Muthumari Amman Temple, UK for their services towards Music. • Dr. M. Lalitha and M. Nandini were honoured with the title of `Shrividya Tapasvi' by the Tapas Academy and Yuvakeertana Trust for their services to Music and Bhakti Oriented traditional Music.